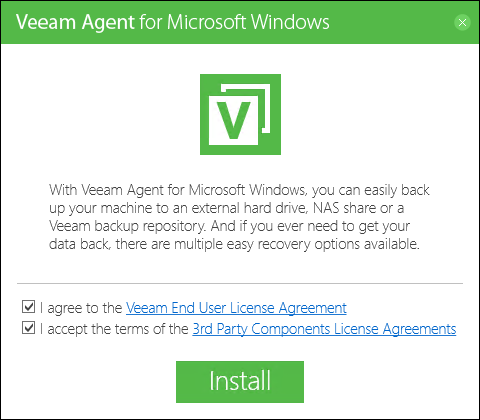 When you install Veeam Agent for Microsoft Windows, you must accept the terms of the product license agreement and terms of the 3rd party components license agreements. To view the product license agreement, click the Veeam End User License Agreement link in the installation window or visit the Veeam website at: www.veeam.com/eula.html. To view 3rd party components license agreements, click the 3rd Party Components License Agreements link in the installation window.